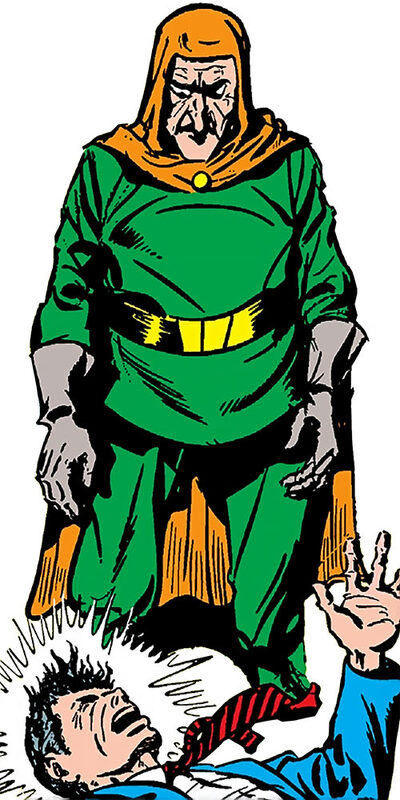 Future Man is an obscure demobilisation-era character, whose main appearance was in 1946 in All-Winners Comics. But the All-Winners era seemed intriguing back in 1974, when Roy Thomas had Whizzer narrate some of these adventures in Giant-Size Avengers. After reading this entry, you can read the Madame Death character profile, which continues the story and discusses stuff. Group Affiliation: Agent of a future government, partner of Madame Death. Base of Operations: Mobile through time. Height: 4’5″ Weight: 70 lbs. A needle-shaped rocket that could also fly back and forth through time. Small grenades producing super-thick black smoke. Weaponised germs. Deployed using bacteriological bombs, these could apparently exterminate hundreds of millions. An “astral image projector” aboard his ship. Using it, the Future Man seemed to be there and could perceive, talk, handle small objects, project mental force, etc.. Yet this was but an immaterial manifestation projected over a vast range. This was also useful to operate far underwater. A “slowdown machine” projecting a ray that could slow living creatures to a crawl. This hit large areas, and as side effect triggered numerous accidents as people no longer could operate vehicles. A “life currents battery” that could revive mummies as obedient, bulletproof soldiers. Howbeit these could be taken down by Miss America (who has about “Class 5” strength). The ship also had a time radio, capable of communicating with the far future. However, this was a difficult operation requiring hours of calibration. Killing people with a look using “mental force”. It could even knock Namor out, but didn’t seem precise. And curiously, Future Man knew that the Torch’s flame would make him immune. Flying through “mental levitation”. Future Man could even carry a half-dozen people with him if they formed a human chain. Sensing incoming deadly danger through “mental waves”. Using other “mental waves” to mesmerise workers so they could assemble far future technology under his telepathic guidance. 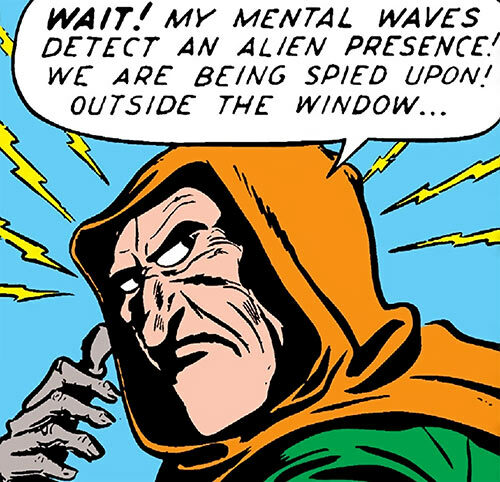 Erecting an invisible mental force wall that could stop even Namor and the Torch. Yet he did not do that when he had the upper hand. The ability to read, listen and presumably speak and write all sorts of languages – including Ancient Egyptian hieroglyphics. It could be that Future Man was a polyglot, but it felt more like a Power when used. Future Man also knew where to position a modest amount of explosives under the Pacific to trigger cataclysmic tidal waves. One suspects he knew about this because this was done in his future, and was an important move in wrecking the Earth’s oceans. At one point, Future Man gestures up and rains come pouring. However, the cloud he pointed at was a cover for his ship. So it’s likely not weather control. One hypothesis is that the camouflage cloud naturally accrues water vapour from the atmosphere, and the ship has a minor system to precipitate it. The Future Man comes from a distant future – reportedly the year one million, A.D.. His Earth has been wrecked by ruthlessly stupid exploitation, and is barely habitable. The oceans have dried up, and the cities have been abandoned. The population thus seems small. A VIP decided to send an agent into the XXth century, to seize the Earth of the past and move there. The objective was to eradicate the vast majority of the XXth century population, perhaps keep some as slaves. And then presumably proceed to wreck this Earth as well. The man dubbed “the Future Man” was this agent. Being a leading scientist, he seemed unconcerned by any effects of tampering with the past. Presumably, this civilisation had established that travelling in the past in the Marvel Universe normally takes you to an alternate timeline . The Future Man didn’t know much about the XXth century. It is possible that there weren’t sufficient historical records for this distant past. It is possible that this civilisation had zero interest in History. And it is possible that the Future Man was aware that he was travelling to *a* past, not *the* past, and there likely would be variance from records. The Future Man was first spotted in the US, in 1946. He allied with well-connected, ruthless mobster Madame Death. She would be his sherpa in this distant past, and was promised vast loot once the extermination was over. However, Captain America was after Madame Death. He thus overheard about the Future Man’s plan. 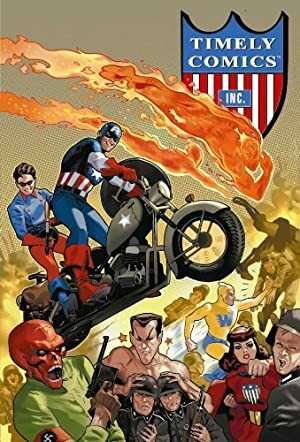 Madame Death and Future Man escaped from Cap and Bucky, but the heroes mobilised the rest of the All-Winners Squad. Cap and Bucky captured a lab high in the Swiss Alps, where the Future Man was brewing a super-plague. A test had already taken out an entire Swiss village within an hour with a single bomb. In central South America (perhaps Bolivia), they triggered awful accidents with a time-slowing ray. But the Whizzer (Robert Frank) beat them back. In the Pacific, they allied with pirates to create titanic tsunami. But Namor the Submariner disarmed the explosives just in time. In Egypt, Miss America (Madeline Joyce) wrecked the machine animating an army of bulletproof mummies serving the Future Man. In the Southern US (perhaps Texas), the Human Torch (Jim Hammond) and Toro (Thomas Raymond) found a way to extinguish the Future Man’s “atomic fire” before it would reduce the entire continent to ashes. The All-Winners deduced that the Future Man’s ship was camouflaged within a black cloud. Moving fast, they intercepted it as Future Man had confidently remained over the scene of his previous attempt. The Future Man held back the entire team with a force wall, then escaped along with Madame Death. However, Cap had sabotaged his ship, preventing him from returning to his distant future. The pair thus plunged uncontrollably into the past. The Future Man eventually managed to fix the ship by hand and without resources. However, they were far into prehistory, and the Future Man’s immunization program hadn’t included shots for such ancient diseases. He thus succumbed to sickness not long after completing the repairs. Howbeit, Madame Death attempted to avenge him. See her profile for more. Obviously, people from the year 1,000,000 speak 1940s US English. It wasn’t even a mental power thing – the systems in his ship were all labelled in English. Future Man is an overconfident, cruel and casual killer. ”Primitives” are nothing to him, except for a handful who make for convenient allies. He’s certain of his superiority. Force Wall is Serious Marginal. Powers that reinforce RV against fire (such as Flame Immunity) somehow also provide RV against Future Man’s Mental Blast. Split induces no loss of APs, but is only usable for Gadgetry Tasks. Split requires persons of opportunity, whom Future Man can mentally dominate. Expertise (Chronophysics, geophysics), Genius (Knowledge of future tech). MPR (Future Man is unusually short, which makes some tasks difficult), Misc. : body mass is 1 AP. TIME ROCKET [STR 08 BODY 10, Accuracy (Bombing): 10, Flight: 10, Fog: 03, Range (Telekinesis): 08, Telekinesis: 03, Telescopic vision: 06, Time travel: 45, Water blast (AoE 5 APs): 01, Bonus: Fog takes the form of a natural-looking black cloud camouflaging the ship]. Telekinesis is some sort of low-powered tractor beam. ASTRAL PROJECTOR [BODY 01, Dispersal: 12, Teleportation: 12, Life Support (No Need To Breathe whilst Dispersal is on), Bonus: Dispersal can be Partial]. This is large machinery kept aboard the ROCKET. Dark-Bomb [BODY 01, Darkness: 08, Grenade Drawback]. These small grenades can also be dropped from the TIME ROCKET (and benefit from its Accuracy). His germ-bombs likely acted as Poison touch: 07 with a city-sized Area of Effect. The germs had a short lifespan, assuming wind and some rain. The SLOWDOWN MACHINE had about Time Slow: 12. But it was usually used with a city-sized Area of Effect, diluting the effect to 6 APs. The mummies had about DEX 03 STR 04 BODY 04, with Skin Armour: 03 (Limited to Ballistic, Piercing and Slashing Descriptors). They also likely had an unrevealed amount of Life Support. The “atomic fire” is similar to normal fire (as in “large conflagration”, not “campfire”), but it “burns atoms” and thus cannot be extinguished. Even sand or water will catch fire. Howbeit, the Human Torch cunningly stopped it by using the atomic fire’s own ashes as a firebreak. I’m not doing a literal modelling of the Astral Projector. Instead, Future Man activates his Dispersal then boasts that it was his astral form all along, ah ah ah ! Which also models what happened in the story more precisely than an astral projection mechanic à la Spirit Travel would. If Future Man opts to stop the projection, then in this modelling he uses Teleportation to return to his ship’s astral projector. In-universe he was always physically in his ship, but in practice there’s no difference. Most of his uses of Mental Blast were done with the benefit of Blindside, particularly against Namor. He could have Shrinking: 01, Always On, but IMO that’s not the clearest approach. The Split thing is a literal interpretation. It could be abstracted out or treated as a sort of Superspeed, but a Limited Split is simpler, more interesting and does allow him to work faster. 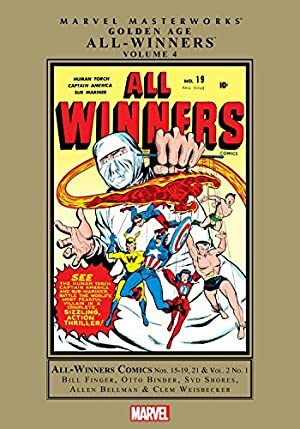 Source of Character: All-Winners Comics Vol. 1 #21. Writeup completed on the 11th of May, 2018.